First impressions are extremely important in the restaurant business. 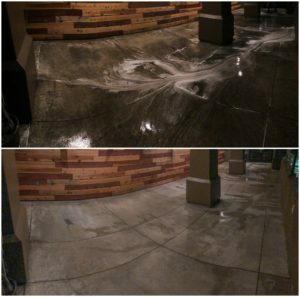 Often, people assume that if the outside of a restaurant is dirty, so is the inside. So if your sidewalk, entryway, patio, and/or building façade look dingy and dirty, it could make potential customers lose their appetites and cost your business money. You need a reliable partner who can keep your restaurant’s exterior clean and attractive. In other words, you need The Pressure Washing Guys. The Pressure Washing Guys are highly trained in the use of commercial hot water pressure washing equipment with adjustable settings for cleaning different types of materials such as concrete, brick, and pavers. We also offer soft washing for more delicate building surfaces such as stucco and wood. In any case, you can rely on us to remove dirt, stains, and even gum thoroughly and without damage to your property. We use environmentally safe cleaning agents and the latest techniques for the best results possible. As a local, family-owned and operated business, personal service and personal relationships are important to us. When you hire us to take care of your property maintenance, we will take the partnership seriously and treat your property like our own. You can rely on us to arrive on time and provide thorough and effective cleaning on each visit. Our prices are fair and affordable and with our total satisfaction guarantee, we deliver an exceptional value for your business. If you are looking for a partner to handle your restaurant maintenance, call us at 949-514-7749 today. We’ll be happy to come to your property to provide recommendations and free estimates for monthly, bi-monthly, weekly, or one-time restaurant cleanings.